Since it is cookie week, I’ve decided to start the week of with a cookie recipe instead of my usual Meatless Monday recipe, and today it’s Chocolate Snow Caps day. And let’s also point out that they have a subtle hint of coffee. Now, let’s just take a moment and think about what these cookies are? And by that I mean pure heaven. Did you hear about last week how The Cookie Monster (or is it Veggie Monster now? haha!) uploaded a video saying he wanted to host SNL… yes, I did say that The Cookie Monster wants to host SNL. (Personally, I would rather see Buddy the Elf host…). Anyway, all this talk of cookies basically means that cookies are on the brain. Have I got you thinking, sorry, I mean craving, cookies? Woops, sorry! Guess you’ll just have to whip up a batch of these. Melt chocolate over a pan of boiling water. Remove from heat and set aside. In a bowl whisk flour, cocoa powder, espresso baking powder and salt together. In a separate bowl, using an electric mixer, beat butter and brown sugar together until light and fluffy. Next beat in the egg and cooled chocolate. Add the dry ingredients to the wet ingredients in two to three additions, mixing well in between. Finally mix in the milk and shape dough into a disk and wrap in plastic and put in the freezer for about 30 minutes or until firm and easy to work with. While dough is chilling, preheat oven to 350. Line two baking sheets with parchment paper and prepare a bowl with your icing sugar. Shape dough into 1-inch balls – I used a cookie scoop as it made them more uniform in size. Roll the balls in the sugar coating and place on cookie sheet about 2 inches apart. The cookies will spread during baking. Bake for 12-14 minutes until the cookies have spread and are cracked on top. The cookies will be soft to the touch. Allow them to cool completely before delving in! This first batch of cookies will be perfect for cookie week, as well as a wonderful addition to your holiday baking! I was swooning over similar cookies at Panera the other day. These look even better! @Mimi - Thanks! 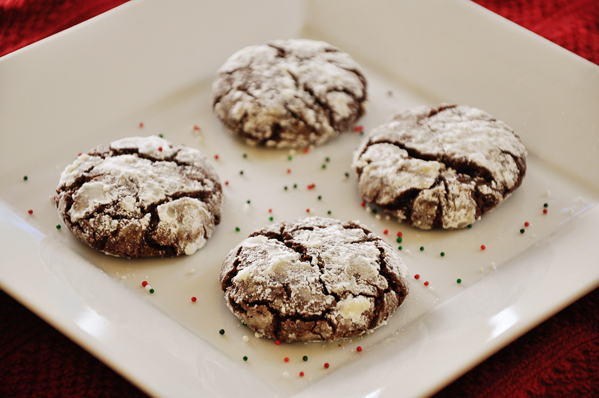 These cookies are definitely swoon worthy!